Probiotic supplements could benefit patients with musculoskeletal conditions who are low in vitamin D, since new research says probiotics can increase vitamin D levels by 25%. Photo by Colin Dunn. Probiotics aren’t just good for your tummy. A new study shows that taking probiotics could boost vitamin D levels, which could be protective against osteoporosis and hip fractures. Up to 40 million Americans are at-risk of develop osteoporosis due to vitamin D deficiency, which inhibits the bone’s ability to absorb calcium. Some studies also indicate that vitamin D deficiency is associated with cardiovascular disease, diabetes, and cancer. While getting more sun exposure is surefire way to increase your intake of the “sunshine vitamin”, people who are overweight, live in cold climates, have dark skin, or who don’t get enough sun exposure are at-risk of a deficiency. Patients with spinal conditions, back pain, and fibromyalgia are also often lacking in vitamin D.
Now a new study, published in the Journal of Clinical Endocrinology & Metabolism, shows that probiotics supplements may help millions of Americans with vitamin D deficiencies. 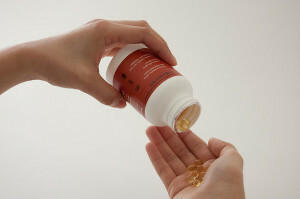 “Although it has long been known that the gastrointestinal tract plays an active role in the absorption of vitamin D, these findings showing improved vitamin D status in response to an orally delivered probiotic are a first, and will inform the development of new products that may be beneficial for people with low vitamin D levels, ” said Dr. Mitchell Jones, lead author of the study and chief scientific officer at Micropharma Limited, a Canadian biotech company. Earlier research has shown that the probiotic Lactobacillus reuteri NCIMB 30242 can reduce cholesterol, but it was unclear what effect it had on the absorption of fat-soluble vitamins. Researchers asked a group of adults to take Lactobacillus reuteri NCIMB 30242 for nine weeks, and took serum blood tests to measure levels of 25-hydroxyvitamin D. The participants who take the probiotics had a 25.5% increase in serum concentration of 25-hydroxyvitamin D. That could make probiotics a worthwhile supplement in people with brittle bones or spinal conditions. New research suggests probiotics may also one day be prescribed for people with anxiety and abnormal stress responses, since probiotics were found to alter brain activity. Jones ML, et al. Oral supplementation with probiotic L. reuteri NCIMB 30242 increases mean circulating 25-hydroxyvitamin D: a post-hoc analysis of a randomized controlled trial. Journal of Clinical Endocrinology and Metabolism 2013; doi: 10.1210/jc.2012-4262. Study shows probiotic Lactobacillus reuteri NCIMB 30242 significantly increased vitamin D levels. Miropharma Limited. Press Release. June 19, 2013. Accessed June 27, 2013. Written by: Marissa Luck on June 29, 2013.Modified on July 2, 2013.